"Here's where the power of the Magic Quadrant comes to the fore. IT organisations use the MQ as a filtering mechanism; by definition, inclusion in the MQ bestows an imprimatur of technology leadership. Moreover, occupying a place in the MQ virtually assures a vendor of being placed on an IT organisation's evaluation shortlist and getting a serious look. This is incredibly valuable, as most vendors know how challenging it can be to gain a fair evaluation if the IT organisation sees the vendor as an also-ran." In the 2012 MQ, Amazon Web Services (AWS) was the clear leader, with significant white space between it and the other four members of the Leaders section of the MQ: Terremark, Savvis, Computer Science Corp. and Dimension Data. According to the latest chart, AWS has extended its leadership position. There is now more white space between it and its competitors - so much so that there is now only one other Leader, CSC, with the other three firms having been relegated to other, less desirable quadrants. This development is quite unusual. 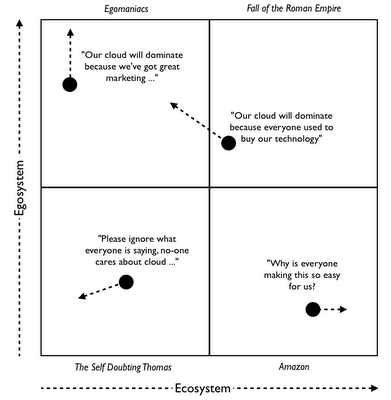 As Lydia Leong, the Gartner analyst who led this effort, says in her blog: "That leads to an unusual Magic Quadrant, in which the relative strength of AWS in both Vision and Execution essentially forces the whole quadrant graphic to rescale." Put another way, Amazon has so extended its lead that Gartner had to change the MQ scale to keep Amazon on the chart, which forced everyone else down and to the left. For any postulant CSP leader, this is a sobering state of affairs. After an entire industry has spent a year critiquing AWS as insufficiently robust, or not secure enough, or not comprehending "enterprise requirements," Gartner says AWS has actually increased the daylight between it and other CSPs. To quote Leong: "While we saw much stronger momentum for AWS than other providers in 2012, 2013 has really been a tipping point. We still hear plenty of interest in competitors, but AWS is overwhelmingly the dominant vendor." With respect to the position of other CSPs, Leong's blog says that many cloud features have become "table stakes," with little opportunity for differentiation among vendors. This leads to a Red Queen world, in which more and more effort is required just to keep up, with no improvement achieved despite an enormous amount of hard work. You might think that, even if AWS is increasing its lead, and even if it's hard for other CSPs to improve their position, at least they'll hang on to existing customers and their workloads. Unfortunately, according to Leong, even that solace is in doubt. "Many Gartner clients now actually have multiple incumbent providers (the most common combination is AWS and Terremark), but nearly all such customers tell us that the balance of new projects are going to AWS, not the other providers." This could hardly be worse news for cloud providers. Gartner's customer base is the Fortune 2000 - large enterprises that should be most amenable to the appeal of cloud service providers that define themselves as enterprise-oriented. Even within this putative bastion of strength, AWS is grabbing share. I've heard a few people rubbish this latest MQ. One person says he believes this outcome was the result of "pay to play". I don't believe this for a minute. First, Gartner doesn't operate this way. It certainly isn't going to jeopardise its crown jewel - its ranking system that's the gold standard for technology market segments throughout the world, for this single assessment. Secondly, from what I know about Amazon, I think it's improbable that it would do anything like a "pay to play" arrangement. I've also heard a few people in the CSP sector say this latest MQ reflects Gartner showing favouritism toward AWS. Frankly, this is incredibly unlikely. A firm such as Gartner is best-served helping clients make choices in a confusing environment - sorting out a set of vendors that are tightly bunched in the upper right quadrant of the MQ. With the clear distinction between AWS and everyone else in the latest MQ, anyone can look at the chart and figure out the IaaS leader. Choosing anyone else is like betting on the Washington Generals. It's a sure loss. So explaining the state of affairs as a kind of "Gartner likes AWS best" seems like sour grapes. Finally, I've heard people just refuse to accept Gartner's estimation of the market reality. I continue to hear CSPs proclaim that their offering is better than AWS, citing some superiority that, upon investigation, seems to evaporate. Recognise that you're going to use and need to manage a hybrid, heterogeneous infrastructure environment. Any notion that your cloud environment will be homogenous is wrong. Proceeding on that basis runs the risk of being left in the dust by competitors that embrace the leader in the space. Develop application architectures that leverage AWS's strengths, namely scalability and elasticity. Many applications are best-served by running in an environment that supports large-scale deployment and the ability to manage erratic traffic. Embrace the opportunity to use an environment that supports those characteristics, and seek out business offerings that require them. You're no longer handicapped by being limited to traditional IT environments that are static and expensive, so don't limit your potential by constraining your architecture design choices. Embrace the potential for experimentation and innovation that AWS presents. It's inexpensive to try something out, and there's no requirement for long-term commitment in the AWS environment. Real-world use and feedback is almost always more useful than abstract discussion, so embrace the opportunity to use AWS as a test bed for new business offerings. Finally, understand that AWS is going to be an important part of your infrastructure going forward. While many IT organisations prefer, understandably, to imagine that their environment will be primarily on-premises with an occasional overflow to an outside cloud environment, the reality of the future is that many, many workloads will be deployed externally - and a large proportion of them, according to Gartner, will be placed in AWS. This is a time to get serious about preparing to use AWS as a strategic part of your computing environment. This latest IaaS MQ from Gartner indicates something unprecedented in my experience in IT. I've never seen a market that reflects such a distance between a single vendor and everyone else. Moreover, despite the best efforts of an entire industry, the leading vendor is increasing the distance between it and its competitors. While Leong was quite explicit about the state of affairs in her blog post discussing the latest MQ, one wishes she had delved deeper into it. Why is there such a distance between AWS's offering and everyone else's? What skill or insight has allowed AWS to create an offering so superior to others in the market? Plainly stated, why hasn't a credible competitor emerged to challenge AWS?